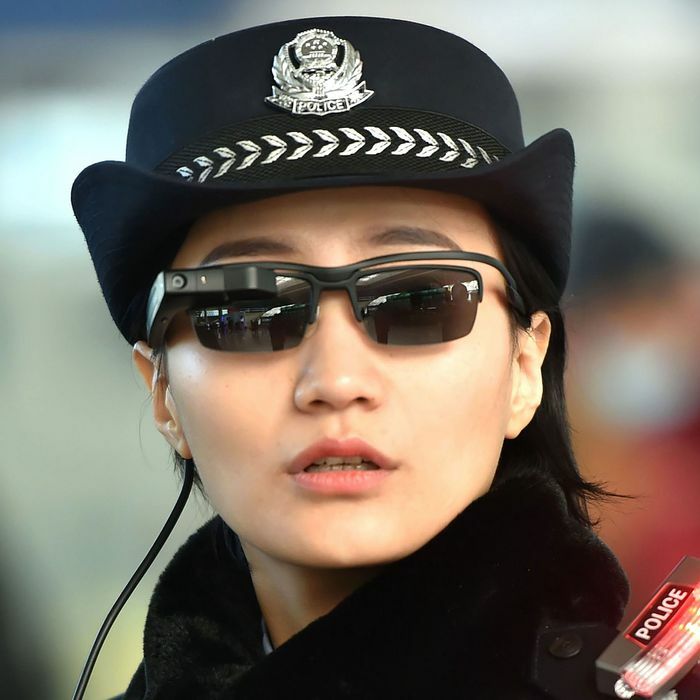 Like something out of The Circle — if you haven’t seen it, don’t; it’s truly Tom Hanks’s least-fine work — Chinese police officers have started using facial-recognition glasses to identify criminal behavior. The glasses, according to The Wall Street Journal, have been around since last year, but the Chinese government has been pushing them this week in anticipation of Lunar New Year, a holiday that involves millions of people traveling throughout the country. China’s state-sponsored media, People’s Daily, said the cameras, which are mounted on traditional glasses, offer “highly effective screening” for finding people traveling with fake IDs or people who are wanted by the government. The glasses have been used to successfully arrest 7 people wanted for involvement in criminal cases and another 26 for traveling with false papers, People’s Daily also reports. ﻿The glasses essentially automate the process of asking for an ID. When the wearer looks at someone, the attached camera apparently takes precise measurements of the person’s face. That measurement is then compared to a database of individuals, each with their own recorded measurements. The tech is reportedly able to determine a match within seconds. For riders, the police want to make sure the person on the train isn’t traveling with someone else’s ID or hopping a train to avoid police. LLVision Technology Co., the company that developed the tech with the Chinese government, says in tests, the glasses were able to “identify individuals in a database of 10,000 suspects in as little as 100 milliseconds,” WSJ notes. And while that sounds high-tech and efficient, the flip side here is that the Chinese government is equipping its authorities with technology that would make it very easy to track and target just about anybody it wanted to track and target. Political dissidents. Activists. People having bad hair days. LLVision Technology Co. also told the Journal that it isn’t selling its facial-recognition tech to regular citizens until it can further study the potential ramifications of what it has created. Because handing it over to the Chinese government certainly wouldn’t have any ramifications.